Ask a Walmart Expert: Can You Use a BOGO Coupon and A Dollar Off Coupon at the Same Time at Walmart? 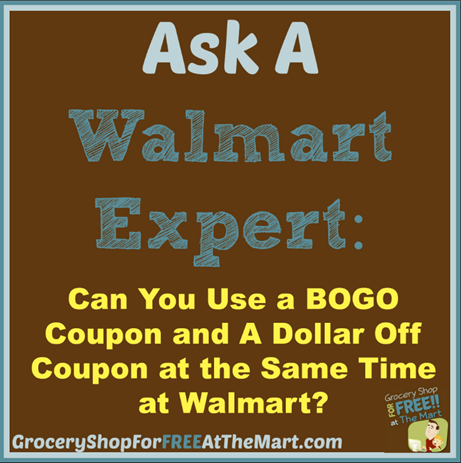 Can You Use a BOGO Coupon and A Dollar Off Coupon at the Same Time at Walmart? This is a question I get quite often. The thinking goes like this: If you use a BOGO coupon on a product, you should be able to use a dollar or cents off coupon that will take money off the product you are buying at full price. That sounds perfectly reasonable and logical and that is in fact how those coupons can be used at almost every other retailer on the Earth. You walk into a Kroger or CVS with a BOGO and $ off and everything is copacetic. For whatever reason, when you use a BOGO coupon at Walmart, the software at the register attaches the BOGO to BOTH items. This makes it impossible to use an additional coupon on either product. Reports started coming in that you could now use a BOGO and a $$ off coupon at the same time. Anytime reports like this come in, I’m always a little skeptical. I’m in enough FaceBook rooms to realize that there are a lot of couponers out there that have no idea what they are doing. Anyway, here’s what happened. So it looks like nothing has changed. The registers still beep when you use both coupons together. Oh well!